In this episode, I talk with Pete Vargas, aka “The Stage Whisperer” who since 2003 has been responsible for booking over 20,000 stages at events worldwide. He’s the founder and CEO of Advance Your Reach and besides just being all around one of the nicest people I’ve ever met, he drops some serious knowledge on this episode about how you as a financial advisor can book local stages in your backyard that you probably didn’t even know existed… oh and it doesn’t require a 10,000 piece mailer or a Ruth’s Chris steak dinner either. Pete starts off with his story about how a speaker literally changed the trajectory of his life and how it led him to what he does today. 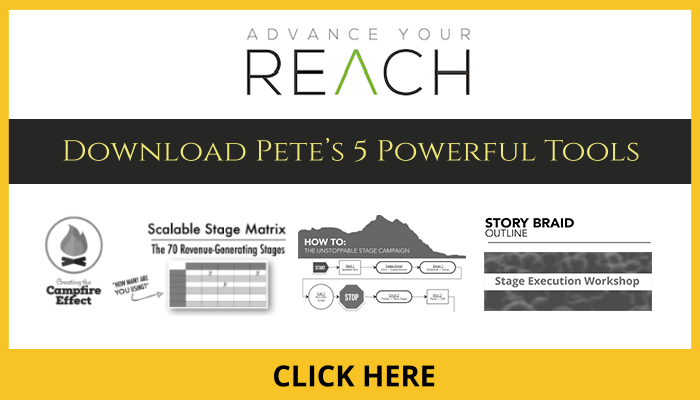 Next we cover Pete’s Story Braid Framework and how following it’s 4 steps will help you connect, educate, and best of all, convert your audience. Then Pete uncovers the thousands of opportunities advisors have nationwide to land local speaking gigs, that from my experience, most of you aren’t taking advantage of and probably don’t even know exist. The best part, they are often free, don’t require direct mail or buying dinner, and you can handpick your ideal prospects, groups that consist of business owners, CEOs, doctors, lawyers, or dentists to name a few. Lastly, Pete does a live role play of the exact conversation he used to land a speaking gig at the White House for one of his clients and how you can use the same framework to book stages in your own backyard. [04:08] How did Pete go from a youth pastor in Texas to becoming known as The Stage Whisperer who has booked 25,000+ stages across the world for people who want to share their message? [14:42] The 3 things you need to do REALLY well as a financial advisor, in order to effectively use speaking in your business. [31:00] Pete explains the massive speaking opportunities that financial advisors don’t even know exist! [37:56] Learn the step-by-step process to booking and winning the stage. [55:01] Pete shares an extremely effective phone script every financial advisor can use to land local stages. This is the same script Pete used to win the White House in 2007. [01:09:51] Pete shares the story of how and why he hired his financial advisor. [01:18:53] Pete’s favorite book and how it impacted his life. [01:25:02] Pete shares the 3 contributing factors that led to his success. JRuhl thanks for the kind words my friend! Michael Hyatt and Ron Carson’s episodes were definitely two of my favorite conversations from a couple of guys I really respect, and there are still a few months left in 2017, so will do my best to keep delivering from my side! [00:00:39] Brad: In this episode, I talk with Pete Vargas a.k.a. the Stage Whisperer who since 2003 has been responsible for booking over 20,000 stages and events worldwide. He’s the Founder and CEO of Advance Your Reach and besides being the nicest guy I think I’ve ever met, he dropped some serious knowledge on this episode about how you as a financial advisor can book local stages in your backyard that you probably didn’t even know existed. Oh, and it doesn’t require a 10,000-piece mailer or a Ruth’s Chris Steak dinner either. So, here are just a few highlights from our conversation. Pete starts off with his story about how a speaker literally changed the trajectory of his life and how it led him to what he does today. Next, we cover Pete’s Story Braid framework and how following its four steps will help you connect, educate and, best of all, convert your audience. Then Pete uncovers the thousands of opportunities advisors have nationwide to land local speaking gigs that from my experience most of you aren’t taking advantage of and probably don’t even know exist. The best part, they’re often free, don’t require direct mail or buying dinner and you can handpick your ideal prospects, groups that consist of business owners, CEOs, doctors, lawyers or dentists to name just a few. Lastly, Pete does a live role-play of the exact conversation he used to land a speaking gig at the White House for one of his clients and how you can use the same framework to book stages in your own backyard. Okay. Get the notepad ready because not only is this episode jampacked with actionable content but Pete literally gifted all you Blueprint listeners a ton of tools to put his ideas into action including a PDF overview of a Story Braid framework, a phone script for booking local stages, a seven-minute example video of how to find local organizations seeking speakers and a bunch more. All of this is available right at the top of the show notes at BradleyJohnson.com/28 that’s 2-8. Links to everything else there too, books mentioned, people discussed as well as a complete transcript of the show. [00:02:41] Brad: One last big announcement before we get to the show and a huge thank you to all of you listeners who have supported my show from the very early days. We’ve just finalized an agreement to feature our show’s content and biweekly articles exclusively at WealthManagement.com. So, you’ll start seeing a breakdown of some of the biggest takeaways of our past shows and, most importantly, our goal is to give you a simple framework to put these ideas into action in your own practice. I literally just submitted the first article which will feature an idea shared from Ron Carson on how he landed his first billionaire client. So, we’ll be sure to send it out to all of you who have subscribed to our email list as soon as it goes live. And by the way, if you haven’t subscribed yet, you can do it by visiting BradleyJohnson.com/subscribe so you’re notified any time a new episode goes live or we have a new article hit. As always, thanks for listening and without further delay, my conversation with Pete Vargas. [00:03:39] Brad: Welcome, everyone, to this week’s episode of the Elite Advisor Blueprint. I have a special guest, Pete Vargas III, Founder and CEO of Advance Your Reach. Welcome to the show, Pete. [00:03:52] Pete: Hey, man. I’m excited to be here. Thanks for having me. [00:03:54] Brad: Yeah. It’s been just a bit. We were hanging out in Carmel out of Jayson Gaignard’s Mastermind talk. So, it was cool to actually get a chance to meet in person. I know we have a ton of mutual friends, had some good conversation on kind of really your specialty. So, they call you at the Stage Whisperer. How did you come about getting that nickname? [00:04:13] Pete: Oh man, I don’t know. We are very, very passionate about stages, man. We’re really, really passionate about stages. I was a youth pastor in Texas and I got called. I had the opportunity to go into the corporate world or had the opportunity to go and take over as a youth pastor for this small little West Texas youth group and I chose to go there. It was crazy and I went there and had no theology background and just thought, “I’m going to bring speakers in to come speak to my kids,” because my youth group was only three kids the first Wednesday night when I showed up. So, I would bring in all these speakers. I bring in financial advisors. I bring in stay-at-home moms. I bring in CEOs, entrepreneurs. I wanted my kids to understand all of the different values that I hope for them in their life that I wish I would have as a young kid myself. And so, growing up in a really broken family, my pastor was encouraged because I bring in all these powerful speakers and I really did bring in financial advisors and they’ve shared with my kids and then my kids would get motivated and inspired to change. And so, when I went to the church board and said, “I need a million dollars to build a youth facility here in West Texas to provide something for these kids,” and my kids have already given tens of thousands of dollars, my church board and my pastor were blown away. Well, they’ve given so much money because they had heard about finances from CEOs, entrepreneurs, financial advisors. And so, it was amazing because we raised the money to build this youth facility and through this process I heard all of these speakers, Brad, and I heard all these speakers that would come in and they’re like, “Man, I know I’ve got something powerful that can change people’s lives. I just don’t know how to get it out there and I don’t know how to get it out there,” and I would give them some feedback and give them some advice. I would tell them what I would do if I were in their shoes to get on in front of more stages and more of their ideal buyers in front of more of their ideal buyers and customers but I didn’t go do it for any of them because I was a youth pastor. And so, I went home, begged and pleaded my dad to come back that night. We haven’t had a good relationship at all. My grandmother had taken me away from him in my teenage years because of what was going on in our life and we hadn’t made amends, and I had tried everything, dude. I tried counseling and church and his siblings constantly telling him to make things right and that night, after my dad heard this man speak, it prompted him to go home and write me a multiple-page letter and he said, “Here, my son is having an impact on hundreds of kids lives and I can’t have an impact on my only son’s life. I’m sorry for the father I’ve been. I’m asking for a second chance to do things right,” and he told me he loved me for the first time in over a decade. [00:08:13] Pete: And my wife and I were crying. We were weeping. We were just like, “Holy cow.” So, I picked up the phone. I called that speaker, Darrell. I listed his cell phone number and I said, “Why are you not sharing this message with everybody across the world? Why aren’t you in front of more people?” And he told me the same thing that all of those speakers that I brought, and I brought over two dozen speakers into my youth group. We grew from three kids to 750 kids my last Wednesday night, all from powerful speakers and he told me the same thing all of them told me, “I don’t know how to get it out there.” And so, I told him, I was a young naïve 23-year-old that day and I said, “Darrell, I’m going to figure this out for you.” And over the last 13 years we’ve been directly responsible for booking over 25,000 stages across the world and so that’s probably the reason why other people, which I’m glad it’s not me, but other people have begun to call me the Stage Whisperer is because we figured out how to book stages, but better yet, how to leverage those stages for people to truly build their business and make an impact that goes deeper. [00:09:22] Brad: So, you were 23 when you’re kind of reconnecting with your dad and it was a speaker’s message from the stage that hit home with him where really nothing else to that point had really done it. [00:09:32] Pete: Yeah. Nothing, man. Nothing. Nothing. And that’s what I – that’s the trend that I saw with my kids too like there would be someone come in and talk about health and wellness and it would just trigger in their hearts and there’d be somebody come and talk about financials and financial planning and financial advising and how to be wise and how to be a giver. And then all of a sudden, we would start taking tithes and offerings on Wednesday Night Church Youth Group, not the main time but in the youth group, and my kids would just give and I was like blown away the first like offering we raised just in our kids. So, yeah, I mean nothing – a lot of times people, I mean, I believe 60 minutes can catalyst something powerful for folks and, yes, so that’s what it did. Something in 60 minutes catalyst my dad and I, my dad to go home and write that letter and mail it to me. It was really crazy. He didn’t drop it off. He mailed it to me like he – yeah, so it was pretty powerful. [00:10:30] Brad: I remember you sharing I think it was a podcast I listened to. You took him that night with this kind of expectation of this is going to really hit home with him and then it was like he didn’t say anything at that the actual event and it was a few days later that he actually where you saw how much it impacted him so that was a lesson for you. You shared of just kind of an entrepreneurial lesson of it’s not always about the instant gratification of what these events do right out of the gates but the lasting impact they make. [00:10:58] Pete: Well, that’s so relevant to the people here too. I didn’t get into the depth of it but that night there were over 1,000 people at that parent event like right just shy of 1,000 but 1,000 out of 10,000, we got pretty much the majority of the people and then a huge percentage of the people in the community after this evening event. And my perception that night after Darrell spoke and shared his message with that audience is that every parent and grandparent in that auditorium are hugging their kids and their grandkids but my dad wasn’t. That’s my perception now. I’m sure every one of them weren’t but I thought, man, if this can’t make my dad want to tell me he loves me and ask for forgiveness, I don’t know what is. And a lot of the times we don’t see it right away. We don’t see things right away like instantly like I wanted to see it right then and there. Well, it was a couple of weeks later. My dad had to go home. He had to process and it’s just like a lot of people who were in front of but he had to go process and as he processed, he reflected and as he reflected, he wrote the letter that quite frankly changed his life and changed our relationship forever. So, yeah, it’s a lot of times too. If your advisors will do the things that they need to do and make sure that they lay it all out there and that they’re great every time that they’re in front of people because my promise is by the time we’re done today, Brad, like the advisor people listening to this, they’re going to be able to go book a stage in their local market that they don’t have to pay for like maybe even get paid. [00:12:32] Brad: So, let’s go there because the anticipation like just you teasing it that little bit they’re like, okay, let’s not wait. Just tell me now. So, let’s set this up a little bit. Most of our clients, they’re great marketers. They’re doing live events very frequently throughout the month. A lot of them have radio shows, a lot of them have TV shows, a lot of them are doing systematic referral events to engage their clients and for them to bring their friends but let’s hone in on the public events because I would say the typical framework, there’s one of two ways which you’re going to blow their minds if there’s this third way they didn’t even know about. It’s typically I’ll host an evening at Ruth’s Chris. I’ll put on some nice dinners and then I’m going to basically share an hour of education and then for those of you it makes sense, book an appointment and come see me. There’s another framework where it’s more of an educational-based event where they might have a local community college and they might actually teach a class a couple of nights, a couple of three-hour sessions and then from there if you’d like to come in and discuss your one-on-one, let’s book an appointment. So, there’s this third way and we’re having this conversation out in Carmel, I’m like, “Dude, this is so brilliant.” So, going to the what you’ve done, the 25,000 plus stages you’ve booked over the last decade plus and how financial advisors are completely missing the boat by not even knowing it exists because, man, it was news to me when we started talking about it. [00:13:55] Pete: Yeah, man. So, I kind of get – I’m leaning in a little bit. I’m getting excited and, hey, I will have some visuals and I’ll have some amazing things to give away so anything we represent this that I’m not able to like show or any gifts, I’ll just give them to the group here. Yes. So, I believe there are three components that you have to have in your business as a financial advisor to make sure that when I do get you to stage here, that you maximize that stage too. So, I want to set the framework correctly and I’ll talk about number one and I’ll come back around the number one. Maybe we can come back to number one at the end and I’ll talk about number two but we’ll dive right into number three. So, number one, I honestly believe through what I’m about to show you through stages that you can add six and seven figures to your business. I truly believe that. I believe the most powerful way is stages and, yes, your own stage but meaning that you pay for so that Ruth’s Chris dinner plus the mailers plus all of that probably cost some $8,000 to $10,000. Is that right? I mean, I’ve been to two or three of them. I do the math in my head. So, let’s flip that upside down here in just a second but there are three things that you have to do really, really well to you speaking in your business. So, you speaking in your business, you have to be great in front of people. You have to have – you have to compel them to want to go deeper with you and we use a proprietary process called the Story Braid framework. It still allows you to educate but the problem is too many financial advisors because I’ve been to about five of these, maybe 10 of them and there’s only one of them that resonated with me and it’s because he connected with my heart right out of the gates and then he closed with the heart at the very end and that’s our whole framework and we’ll come back to that. We’ll talk about that a little bit more as much as we need to but we want people to design a signature talk that has the Story Braid framework into it. [00:16:01] Pete: Here’s the thing. People don’t care. You don’t win their heads until you win their hearts and once you win their hearts, their minds are open to listen to all the education that you can provide. And so, I want to at least hit on that at the end because I want people to understand how to walk through that Story Braid framework and actually, Brad, if you don’t mind, I might just for two minutes tell – I’ll just give people the quick overview of that. Is that all right, since we’re here? [00:16:27] Brad: You just keep rolling, buddy. [00:16:28] Pete: Okay. So, here’s what you want to do. Here, when you design a presentation, a signature presentation, and I know the advisors have their presentations and I know that a lot of them are very educational and some of them are inspirational. But here’s the three components that make an incredible presentation. Number one, I want it to be inspirational, number two, I want it to be educational and, number three, I want it to convert. It has got to convert and here’s what the Story Braid framework does and I’m going to tell you, only about 2% of people, I’ve seen over 1,000 speakers and I want financial advisors into there. I’ve seen probably 50 financial advisors in my lifetime speak and I’m telling you there’s one or two that just absolutely knocked it out of the park. They were great. Whether they’re on a podcast or they’re on a live stage, they were great and here’s what they do. They lead in with the heart. That is the first piece. There are four pieces to the Story Braid framework. It starts with the heart. People want to know that you walked in their shoes and they want to know that you know how they feel. They want to know that and if they know you understand how they feel and that you’ve walked in their shoes, you’ve now put down every guard that they have up against you, “Oh, this guy’s going to sell me something. This lady’s going to sell me something.” As soon as they understand that you walked in their shoes and you know how they feel, a.k.a. the hero’s journey story, that is when they lay down all of the walls to get rid of all – they go from this kind of mentality which you’ve seen them in your audiences to this kind of mentality because they know you realize that you’ve been where they’re at or you have a client that’s been where they’re at. It doesn’t have to be you. Now here’s the beautiful thing. As you lead with a story like right off the bat, I’m going to tell you how much percentage time you spent in each of these four areas. So, after you go from the heart, you use the highlight reel that now transition into your signature system. And every financial advisor needs to have their own signature system. I call it a proprietary process. Make it yours. I love what Advisors Excel does for their advisors but I want every one of the advisors and I love what advisors do but I want every advisor to have their own proprietary process. It is your way of doing business. It’s basically saying if you do this in your life, you will see the results that you want. And so, the second piece is the head. It’s teaching them your proprietary process, teaching them what they need to do to get the results in their life. Because remember, the only difference between you and them, you’ve been where they’ve been but you’ve come out. The hero’s journey says that you come out on the other end and your highlight reel reveals to them that you came out on the other end and now they want to know the difference between where they’re at in their lives and how you’ve gotten the results that you’ve got. [00:20:27] Pete: And here’s the big mistake that everybody makes. They try to brag before they’ve connected with the human being and that is not working in our society today like people want to know. They want to connect before you brag so make sure they do that but in the head part, you talk and you teach around your signature process and each piece of your signature process, each piece of it you reconnected with either story, data, case study, analytics, a quote, video. You drive each piece of your signature process home. I typically say it’s three to five. I like the three to five. I’ve seen people do seven, six, four. I’m a three to five type of guy. I just think that everything you do can fall under three to five big pillars and each of those pillars you drive it home after you’ve caught it with something that’s heart-related one time but then something case study or financially driven or data driven, not financially, data-driven the next time because then you’re speaking to both the left brain and the right brain as you drive home your signature process. So, that’s the signature system in your company like that is the head part. People want to know how you’ve gotten the results. And so, that’s what you’re teaching them how to do. And here’s what I want you to know. If you are great at teaching this, they have two decisions to make when you’re done talking. Yes, I believe in that signature system. This person has walked where I walked. He understands how I feel. She understands how I feel. I either have to go do this on my own because you’ve laid it all out for them or I need to go do that with them. I’m sure they can get me the results a lot faster than I can get on my own. And so, that’s the headpiece. That’s the second piece. And so, now we went to the heart. We went to the head. Now we need the hands. [00:22:27] Pete: We want them to take action. We want them to take action. And so, what do you do to get them to take action? Well, there’s two things. It’s called a tactical call to action and an emotional call to action. And during the middle of your presentation, I love the last piece of your process to be your strongest teaching piece. So, your signature system, make sure the last piece that you teach to the head is your strongest piece. And what you do is you give away something that they would pay for while you’re teaching it. So, like today, I’ll give you a perfect example. I’m going to show you how to win a stage. I’m going to show you how to win a stage today here in just a few minutes. The problem is I can’t teach you all 10 steps of it today. I can only teach you one step of it today because of our time here today but I have a free giveaway that will teach you all 10 steps of it. And so, when I’m on a stage, I teach stages last because I want to give away that free giveaway while I’m teaching it. Like in the midst of teaching it, I want to be able to give it away. It doesn’t feel like a lead capture because it’s congruent with what I’m currently teaching and so I give away that piece because I want to capture the names in the room. And if you do so well, you will capture 80% to 90% of the people in the room. 80%, 90% of the people in the room, when this is not your room. We’re assuming like Brad said this is the third room. This is not your room. We want you to capture 80% to 90% of them. And so, that is the first thing is you’ve got to have a tactical call to action that gives them something away for free and then if you really want to get like and I know this is a smart like a really smart group. I’ve done my homework and it’s amazing. If you really want to get kind of advanced, make a promise that something that you can win that they can get in their life. [00:24:30] Pete: So, the second tactical thing like if you can do this in your presentation, make a promise on the front end of a win that you’re going to get them by the time you’re done presenting today. Did anybody hear my promise at the front end of my presentation today? Yeah, I made a promise that you can go book a stage in your local market the next day or two if you really want to. So, if there’s a promise that you can make to them in their life like some promise, so now you’ve given away for something for free and if you make that promise, you better make sure you can give them the resource to be able to do that which I’m going to do for you today. But that’s what you want to do in the hand section is give away something for free so we can actually click their names and get them a win in their life. That’s what we want to do with the hand section so that’s the third piece. It’s the hand section. And then the fourth piece of the proprietary process is the heart. You close with the heart. Open loop something from the beginning of your presentation that you now can close the loop on, on the backend. Open loop something that you can close loop on the backend. And now you close the loop on an opening story. You bring your opening story or some piece of your opening story full closure. And so, I talk about where my dad and I are at today and I talk about how my dad had another son at 49 and my stepmom was 48 and when I went home to meet my baby brother for the first time, my dad walks me out to the car and he takes my wife, lets her get in the car, takes me to the other side and he says, “I want you to know you’ll always be my little boy but I feel like JT is my second chance to get to do things right.” And I then share with the crowd as I’m closing, had it not been from a speaker on a stage, not only with my dad have not gotten a second chance to do things right with JT, he also has become the greatest grandfather to Keaton, me and Emma that you can even imagine and that was because of the power of a stage. [00:26:37] Pete: And so, that’s how I close the loop on the opening story that you all heard me tell today. It’s to close the loop. I’m telling you, you’re one signature talk away from being the highest closer in the inspire and educator out there. And so, here’s what I want – no, those are the four pieces. General rule of thumb, 10% to 20% of your time is spent on that opening heart, 60% to 70% of your time is spent on educating meaning the head, and then 10% on the hands on the closing heart. That’s just the general rule of thumb. So, if you have 30 minutes, you can use those percentages to actually design your signature talk. I need you all to just have one great signature talk. Because when you have all of those pieces, when you just are educational and you only speak to the head, you’re boring. And when you only speak to the heart, all you are is an entertainer. You make people cry and laugh but that’s it. [00:28:40] Pete: And so, that’s why I want people to be able to convert from a stage because if they go deeper with the advisors and their services, I’m just letting you know my life’s change right now because of the policies and the life insurances and all of the stuff that I have in sort with my financial advisor and I would’ve never had that had I not gotten deeper with him. And so, I want people to go deeper with them and that’s why it’s really important to design one incredible signature talk. That’s it. [00:29:07] Brad: So, that was huge. Thanks for sharing all that. I know people pay you money to share that and you just give it away for free here so thank you. [00:29:15] Brad: Blueprint listeners, that was huge. If you didn’t get that as Pete was going through all that so we’ll make sure, Pete, any of those diagrams that can help, we’ll throw those in the show notes too. You hit on a couple things. Thanks for supporting everything I’ve been saying for like the last year or two by the way. So, we spent a lot of time with Bo Eason who’s great. I know we talked about him. I know you’ve connected with him on some levels. He spends a lot of time on story and using it to open a presentation so that people connect with you which is basically what you just also seconded how important that is. But where I think a lot of advisors fall short is a great story to open but now as you go into what you call the head section, the second section, there is no proprietary process. And we’ve spent so much time with our clients, how do you name? How do you trademark? How do you separate yourself in your three to five-step proprietary process? And I just love how you frame that up where your strongest teaching moment, you give that away for free. So, let’s since we’re on the presentation piece right now, let’s go there and then we’ll circle back around to how you can book stages. So, let’s speak on this third stage. So, I think we’ve kind of left this mysterious third stage out there. So, we’ve got your typical dinner seminar then we have maybe a college education class and really what you’ve specialized in is how do you land free speaking gigs where you’re not paying anything and people are asking you to come in on their stage. So, can you just expand on what does that world look like? And then I want to go into how do you capture the names there before we get on to how you actually book them if that works. [00:30:53] Pete: What does that world look like? Be a little bit more specific what you mean on what does that world look like. [00:30:58] Brad: I just think it’s so foreign. I think in financial services, guys are used to paying to speak and so this mysterious world of, “What? Somebody would hit me up on the phone or I would call somebody up and they would invite me onto their stage?” You’ve booked tons of stages with entrepreneurs, just ideal clients for financial advisors in the room just there to listen to what they have to say. So, can you just give us a 30,000-foot view of what are some different stages, what are some different areas where you’ve booked speakers, maybe even financial advisors to speak so that they understand the opportunity there. Because it’s such a foreign world, a lot of advisers don’t even know it’s out there. [00:31:36] Pete: Yes. Here, I’ll give you the analytics of this and so there are 23,000, I’m just speaking in the US right now so any advisors listening outside the US, I can tell you your numbers but I’m speaking to the US, 23,000 national associations in America and it’s growing. It’s growing. It’s growing. And if you can’t, for those who can’t see me, the national is the parent. Let’s look at it as the parent. That’s the parent national associations in America. Underneath that, they have their state chapters that report to the national and the state chapters and these are membership-based associations. Under the national, you have the state. There are hundreds of thousands or over 100,000 state associations meaning those that report to the national. If we have a perfect world, all 23,000 would have 50 states if that makes sense. All of the 23,000 but that’s not how it works. So, there are hundreds of thousands of state associations. Now here’s the beautiful thing for the financial advisors. There are then under the state local associations and there are millions of local associations that are under the covering of the state that are under the covering of the national. These are membership-based associations in any niche that you can think about, CEOs, chiropractors, dentists, doctors, lawyers, plumbers, you name it. There are even stay-at-home mom associations. There are prayer associations. There are pastor associations. You name it. There’s an association for which means that the national have engagements typically one to two times a year where they have a big conference just like Advisors Excel does. [00:33:38] Pete: The states also have one to two conferences a year on average. But here’s the beauty, the local tends to meet monthly. Where the state national put on two big productions or one big production a year, the local meets monthly which means that every one of the financial advisors when I show them how to start winning stages, they have an opportunity with millions of stages that potentially meet every single month to go and speak and be an incredible content provider and I’ll talk about that whenever we get to the stages but to be an incredible content provider and so that’s what exists. So, your ideal client, whatever your ideal client is, there’s an association in your backyard for them. So, I know a lot of financial advisors who love doctors. I know a guy up the road, my buddy Justin, he loves to target doctors. Well, he loves to target chiropractors. He loves to target dentists. Why try to like one-off them? Why don’t you just go meet where they’re already at, in your backyard where 42 of them come together every single month and go provide an amazing presentation in the way that I just showed you how to provide it? Why not just go meet and be a content provider? You’re not going to be able to sell but you do a good job with your presentation how I just showed you how you to do it and I’m glad we started there, Brad, because you do a great job with your presentation then when you get in front of those 42 doctors or lawyers or attorneys or dentists or CEOs or whatever it is, entrepreneurs, now they’re all in one room and you didn’t have to be the one to spend all the money to get them in a room. That association gets them in the room naturally every single month. So, hopefully, that opens up their minds and imaginations to the whole – and that, just for the record, is just the association world. [00:35:34] Pete: There is also a public seminar world over here that has nothing to do with associations meaning they don’t have a membership base. I would say Advisors Excel is probably a public seminar because they don’t have like state associations and local associations. Pete Vargas hosted his own event. He’s a public seminar. There are people who are training chiropractors and dentists and lawyers and doctors and CEOs. They have their own events. They’re public seminars. And a lot of people think public seminars are the big space. The public seminars are like a lake and it is a big space of events that exist in your backyard. The associations are like the ocean. They’re endless, man. And so, I love to not discredit either one of them because they’re really big. And so, if we were doing this visually, I could go show people right here on this screen how – maybe I’ll just provide a seven-minute training. I’ll just show one association and I’ll give that training for the show notes and I have it already, Brad. It’s our chiropractor example and I’ll show you how I go to one website and I can see that they have – I think I don’t know the numbers. They have a national association that has two chiropractic events a year. And then with one drop-down menu, you can see that all 50 state associations and who the executive director is and who their phone number is and who all of their information is and then when their event is. So, you can see all 50 of the actual states and then you take it one step further and I don’t know how many it is in the local but you can see the hundreds and hundreds and hundreds of local chapters around the US, all in one view from one shot. So, just in that chiropractic one association exists 500 speaking opportunities and here’s what I want the advisors to understand. This is the power behind it. Yeah, the national was cool. They meet once or twice a year. Yeah, the state is cool. They meet once or twice a year. [00:37:34] Pete: But these locals meet monthly. That’s what I want the advisors to see. They meet monthly so you have an opportunity to win that stage potentially every single month. So, hopefully, that does what you – does that do kind of opening up the world of stages? [00:37:50] Brad: Yeah. So, let’s just go deep there. I’m going to throw the other question on the shelf for a second. [00:37:56] Brad: So, let’s just say I’m a financial advisor. I’m listening to the podcast right now and let’s say I happen to specialize in chiropractors and let’s say I check out the seven-minute training video. What’s the next step? If I say, okay, a lot of our guys have marketing directors. They’re running big operations. This might be a marketing director reaching out on their behalf. What would that look like to start to engage and actually book that stage? Can we get it? [00:38:20] Pete: Yes. Absolutely. So, this is like specialized like I’ve worked on this for you specifically and for your audience specifically. Here’s what I want you to know. Let’s go slow. So, I talked about being great on stage and I do agree with Bo. I believe in Bo’s story mentality. I just know that story alone without a full-blown presentation in a way that I outlined it is you got to have that full presentation that does all of the components. And so now that we are going to be great on stage, let’s go win stages. So, that’s the second piece of this pie is let’s go win stages. So, as financial advisors, they need to understand a few things. So, the first piece that financial advisors need to understand is they’re going to have to go position themselves a little bit differently, a little bit differently. I don’t want financial advisor company ABC to be the person who’s winning these stages. I want the financial advisor personality brand to be the one that’s winning these stages. You have to be – it’s okay. This is not a bad thing. Let’s separate. I want to separate kind of the financial planning practice versus – or the wealth management practice from you as a content provider. [00:40:28] Brad: Right there. I mean, that be as simple as like even on your website like as Book Pete, right? [00:40:34] Brad: Book Pete to Speak or something to that effect. They could just even add that on their regular financial advisor website. [00:41:44] Brad: So, let’s dig into there real quick. Because what’s cool is you go back to how the presentations actually laid out the head section where you’re looking at a three to five-step signature system. Now you’ve got three to five different angles that you can hit that same talk from that just go right back to your signature process anyway, right? [00:42:01] Pete: That’s exactly right, bro. And so, sometimes I will spend equal time on each piece of my signature process and sometimes I’ll go deeper into it depending on what the person wants. And so, today we’re going to go deeper into stages and that’s what we’re doing. So, yes, I can have two to three different angles of that signature talk. I’m not asking you to create three talks. I’m asking you to have one that you create and then you can create two or three titles that are all different angles that are emotionally driven titles. Don’t make them bland and don’t make them boring. There is a document that actually Amy Porterfield created and I’ll give her credit on that and I have the document so if you can give her credit on that too but it’s basically how to create a talk title and she – it’s the best thing that I’ve seen out there. Just create two to three catchy talk titles that somebody who has 40 CEOs in the room or somebody that has 40 million-dollar entrepreneurs in the room or somebody that has 40 doctors in the room, what is the pain point that they feel that your talk would help address? And so, if you can position the talk titles, that’s important. That’s a second piece that I would really have. A third piece I’m going to go little bonus here is I would love a video, a simple video like a simple little video that is a little bit of a promotional video. You can do one of two things. You can either do a promotional video like a promo video and if you don’t have any speaking experience then I’m going to go to the second video which is called the “why me” video. So, the promotional video is just a two to three-minute highlight reel of you speaking and I’m sure a lot of you have footage and coverage from your events so it’s just a highlight reel of you speaking and sharing and all of that. So, you can do that or if you’re like, “Pete, I don’t have that,” then do a “why me” video and you’re basically in about two minutes saying this is why you need to choose me to come speak on your stage and you’re speaking to the pain points of their audience. [00:44:01] Pete: And I have the “why me” script. I’ll give that to them too, Brad. I mean, I have the “why me” script that they can follow the script and this is all the stuff like we get a lot of stuff but I’ll give it to you. But it’s the “why me” script and so you can – I could go do the “why me” video shot right now today in my backyard. [00:44:16] Brad: How long is the “why me”? [00:44:18] Pete: It’s about a minute to two minutes. A minute to two minutes, yeah, a minute to two minutes. And so, if you can’t get a promo video because a promo video takes some time and some energy and some editing then do the “why me” video. [00:44:28] Brad: On the video promo, so a lot of our guys do radio shows weekly. A lot of our guys do TV media appearances. I would assume those would be great things to splice into that. [00:44:38] Pete: Huge. Like if you could just get an editor to take your existing stuff of you on radio, you on TV, you on your own stage and create like this role, it will give you not only great video but it will give you a massive amount of social proof. And so, the fourth piece that you need is you need the speaker kit and the speaker kit is simply a one to two-page PDF document that your team, I’m going to show you how to use this here in a minute, but basically, it’s why they need to hire you as a speaker. It’s like it’s your speaking titles. It’s more about you. It’s some social proof on there. That’s what it is. It’s a simple one to two-pager. [00:45:17] Pete: As seen in – exactly. Yep. So, it’s an overview about who you are and, remember, stay away from like he is the founder of this financial practice or this financial agency. This is about you. We want to position you as a content provider and as an expert because that’s what people want to hire as speakers. So, those are some of the positioning elements. The big transition I want people to see is I want you to move from folks seeing you as an advisor to folks seeing you as a content provider. That’s the shift that we need to make. [00:46:33] Pete: Here’s what I’ll tell you. Story braid your speaker kit. Same thing that you story braided your signature talks, story braid your speaker kit like you want them to connect with you right off the bat. They want to know who you are. They want to know that you walked in their shoes. They want to know that you had financial, you know, they want to bring you in to solve financial challenges that their audience is facing. How to put more money in their pockets, how to save more time and not having to stress about financial things. And so, think about their pain points and their problems and walk in their shoes and be more laid-back in this like this does not need to be like uptight. It needs to be – it needs to connect with them. This one to two pages simply needs to connect with them. And I’ve got a guy who’s created our like two-pager and I can reference him in the show notes and he’s great but he knows how to make people connect with you. So, it’s not like tight and rigid, and it’s laid-back and making sure that they know that you connect with them and that you’re going to solve problems for their audience. They don’t really care about all of the education or all the financial certifications that you have. They want to know that you’re going to come in and deliver content that’s going to change your people’s lives. And so, that’s what you need to be a whole lot more laid-back. So, Brad, I can’t agree with you more on that. [00:47:48] Brad: And maybe a picture of your family. [00:47:49] Pete: Yeah. A picture of your family. [00:47:50] Brad: That might be a good thing to have in there, with your kids. [00:47:52] Pete: Right off the bat. Like right off the bat. Yet. For sure. Absolutely. [00:47:55] Brad: Yeah. People want to work with human beings, not robots, right? [00:47:59] Brad: Cool. Okay. So, you just laid out the four steps for booking stages. Is that it? And then are we transitioning to once that framework is set up, now here’s how to engage the actual host that book the events? [00:48:11] Pete: Yeah. That’s not even the booking. That’s just the positioning. So, to book a stage as a financial advisor and I’m letting you know like here we go, we’re moving to the third type of stage. I’ve shown you all of them that exists in the association world and I’m rolling up my sleeves right here. And now it’s about time to go find and win them, find and win them. So, there’s positioning which we talked about, there’s knowing which we talked about a little bit earlier, know all of the local stages. [00:49:22] Brad: Pete, this is like setting a new record for most things shared on one podcast. I’m incredibly grateful. I mean this is just, you’re the man. [00:49:30] Pete: Well, here’s what I want you to know. Here’s how I’d find them and this is what this document comprises. Who do you want to be in front of? And so maybe you can – I know it’s CEOs. Tell me who they want to be in front of? [00:49:40] Brad: Let’s go, I know you’ve had a lot of success with like the EOs, the YPOs of the world. Those are super successful CEOS and high-income earners. Maybe let’s just use that as an example. [00:49:50] Pete: Yeah. So, EO, you could go to EO. So, let’s say, you’ve defined like layout like I’d ask everybody on this interview to do this for me. Who are 10 specific niches that you want to be in front of? And basically, my document tells you who those are so we’ll get you that document but who the 10 niches you want to be in front of? You want to be in front of CEOs? You want to be in front of successful entrepreneurs? You want to be in front of doctors, dentists, chiropractors, attorneys, lawyers? I don’t know. So, identify those 10. Just pick 10 like you probably can look in your portfolio of people you serve right now and there’s probably a common theme of like the top five to ten. That’s the first thing you want to do. Then you want to go Google it. [00:50:34] Brad: Quick aside, Pete, would large corporations fit into that too? Let’s say I’ve worked with a ton of IBM employees. [00:50:40] Pete: Oh yeah, bro. That’s how. Yeah. I’ll share something at the end that will drive that home. So, there is the place where they all conglomerate together so the association but here’s the beauty. When you get the association, it has the 50 like I’m speaking at EO Colorado. EO has requirements that you have to do $1 million a year of revenues. It’s perfect for every single one of your advisors but what I’m telling you is there are dozens and dozens and hundreds and hundreds of those opportunities as well. But here’s what you want to do is that you want to start searching that. You want to start searching national associations of those 10 things that you just wrote. Or Denver, dentist associations in Denver, lawyer associations in Denver or Colorado, attorneys, doctors, chiropractors, entrepreneurs, successful businesses, whatever you identify you want to start Google searching that in your market and you just want to do market research. And you research this. And there are five things you want to find out, the organization’s name and with that, just so you know who is the person that runs that chapter. It’s very easy. It’s on the website. You want to find out their phone number, their email, their address and how often they meet. First Friday of the month, third Friday of the month and you want to put that into spreadsheet because here’s what I want you to know, there’s no greater time to win their stage than the week after they just met because they’re tired and they’re worn out from that meeting and so if you drop them a direct mail piece and a little gift in the mail saying, “Hey, I hope your event went great. Look forward to talking,” there’s no greater time. That’s why I love the date of the event because it knows when I’m trying to target it as well. Those are the five things you want to find right there. And so, as you’re finding these, I would encourage you all not just identify the 10 types of niches you wanted to be on but let’s go find 25 organizations that you need to be at their local events or at their state events. [00:52:44] Pete: The beautiful thing of me is I can choose Colorado Springs. I can choose Denver and I can, not only the local associations. I can also choose the state because Denver is right up the road from me so I’m at a ton of state associations speaking and I’m at the local Denver and local Colorado Springs chapters which have multiple chapters in them. So, I just want people to understand that. So, now that we found them, you want to hit – I mean does that make sense how we find? I’m just using a Google trick. One Google trick to find them. It’s really easy. I could go find a stage right now for anybody. Now we want to win them. And that’s the last piece of this equation. How do we win them? The most valuable gift that I’m going to give you today and I’ve already said this, the most valuable gift that I’m going to give you today is our unstoppable stage campaign training and I’ll make sure that Brad has that and it’s we have a systematic approach of how we use phone, email, direct mail, social media and video to win stages. We have a complex, I mean, it’s very simplified but it’s a very detailed 10-step system of how we win stages. It is the exact campaign that we’ve used in our business and in many people’s businesses to win stages. And so, it’s a systematic approach to winning those stages. I just want to share one that you can go get wins with today like today, not tomorrow, today that you could get wins. And so, I want to give you the whole training on that entire system. I want you to be able to have it and use it in your business but here’s what I want you to know. You’re only – you may have to do one piece especially with locals. I could go win a local stage today by just doing this one piece, me, myself. I’ll actually go win a local stage today. How about that? I will go win a local stage and I haven’t contacted. I’ll start the process today. I’ll probably have it by the end of the week. So, I want you all to know what I’m about to show you is very, very, very easy. [00:54:44] Pete: And so, here’s what you want to do. Just because – they probably have a team member or someone on the team, you can – I want to use the phone piece of it and, remember, I said there’s five areas, phone, video email, regular email, social media and direct mail. I just want to use the phone script. So, this is the actual phone script that won me the White House in 2007. It is the actual phone script that won me the White House and it’s the phone script that can win every advisor local stages. So, it goes something like this. And I’m just going to pretend and, Brad, you don’t need to reply but it’s basically there are multiple parts to it so I called the guy. I did my research. Research needs to be a constant part of your business so if you can have somebody in your company that’s searching local stages either monthly or biweekly, if you want to be on a dozen a year, all they have to do is research once a month and you will get a dozen a year in your backyard. You should have no problem doing that. But if you want to be on one a week then they need to be doing a biweekly or weekly research. So, you need to have someone on your team committed a few hours a month or a few hours a week researching local stages. So, that practice just happens for us in our business and in our clients’ businesses. And so, in 2007 I came across that the White House was hosting a Safety School Symposium in Washington DC because remember, I represented Rachel’s Challenge, the first girl killed at Columbine and I got the five pieces of information. I picked up the phone and I called the guy and this is kind of how my script went right here. “Hey so and so,” and this is all documented on the internet. I usually do with the video component so I kind of need to role play. [00:56:23] Brad: You want to role play with me? [00:57:31] Pete: And that’s okay. Actually, President Bush wrote an endorsement letter for Rachel’s Challenge and Foster Freeze,” and let’s pretend you all of a sudden like, “Oh man,” because you would know these names. “Foster Freeze was a huge advocate of Rachel’s Challenge. And so, we are really interested in being a part of this symposium and not only do we want to do that, we have a big list and a big email list and a big following across the country. We also want to be able to promote this out to our entire list and make them aware of the symposium that we know you’re not only hosting live but will be seen on television, national television as well. So, what do I need to do to get Darrell there?” And we can pause there because now Brad has no idea. That was a phone call on a Monday. Within two weeks we were speaking on the symposium. [00:59:17] Brad: Let’s go to that win-win because every advisor can do that. Every advisor has a client list. They’ve got a much bigger probably email list from all of the events they’ve done over the years and what’s every promoters problem? I don’t want to throw an event and nobody shows up. Right? So, now you’re coming on you’re like, “Not only would we love to speak there. I would love to help you promote it and I’m basically going to help you do your job which is throw a great event.” So, that’s brilliant. [00:59:44] Pete: Yeah. So, here, let me tell you about the win-wins because here’s the win wins. You have to choose your win-win. So, the same script, you better know what they’re about and what their event’s about and talk about them and only them. Then you come and talk about yourself and how you can help them solve a problem and how you’re not you but, “Brad is a phenomenal speaker. I work for Brad and here’s how he solves the problem.” I was speaking for Darrell. Somebody else would speak for the financial advisor. Then the win-win you can choose. Can you help promote for the event? Can you buy the $500 luncheons because you see that the luncheon is only $500 to $1,000 because they’re not doing it at Ruth’s Chris? They’re bringing in Jimmy John’s so they’re bringing in some catered thing, maybe a nicer catered thing. They’re not doing a huge meal but a lot of these meals are costing $1,000, $2.000 tops so maybe you become the sponsor to speak. And now there’s not this whole like brain damage of, that’s not brain damage, that’s not the right word but advisors put in so much time with these. Because my advisors tell me they put in so much time with the dinners and the mailers and all of that. It’s such a big process. Why not go to the room that has your perfect set of buyers all sitting in one room? Like you can host a luncheon over here. I’ve been to one and it’s like, “Oh, I know that doctor and I know that doctor but I also know the 23 other people aren’t probably the most qualified,” and you can tell from their conversations why not go to the room where the doctor, doctor or CEO, CEO all come every single month like the ideal room for you? So, maybe you do want to make your win-win sponsoring the lunch because they would eat that up too. So, you got to determine what you want your win-win to be and say that in that initial conversation. I’m telling you, if you have somebody on your team go do this 10, 20 times a month, you will be on somebody’s stage every single month. Now you got to have the positioning elements and some credibility and some speaking topics and all of those other things that we talked about but I believe financial advisors can be on a local siege every month or every week if they choose to. [01:01:45] Pete: If they choose to invest some time and some marketing dollars and some marketing energy into this process and I’m telling you, I believe that it will land them more clients because the third part of the equation, Brad, for us is, yes, you got to be great, yes, you got to get on stages but then you got to scale past the stage with your products and services and that’s the one issue none of the advisors have. They have their portfolio of services that they can offer people so that they can simply get on those stages. They have the portfolio of services that people can go deeper with them in. [01:02:52] Pete: Yeah. So, I would say with a whole campaign implemented, I only did one piece like I love to send them a gift in the mail. I love a follow-up email sequence. By the way, that’s something that we completely built out. We build that whole campaign out. It is. I don’t mind sharing that. We build the whole campaign out for somebody. With the whole campaign implemented, when people are going after national and state stages, I say it ranges from 5% to 10% to be conservative like those are big stages. But when you’re talking about local, it depends on the elements that they have but people should have no, I’m going to be really conservative here, should have a very easy time landing 20% but if they really dial in this whole process, they could be landing 30% to 40% to 50% of the stages that they go after. That’s a gut feeling. Just that 30% to 40% to 50% is a gut. The 20% is pretty conservative like you should have no hard time with every 10 that you identify being on one or two of those if they see you as a content provider, if they see you as a content provider that can serve their audience. [01:03:54] Brad: Well, and with the equivalent being spent $10,000 to fill a room of prospects that you hope qualify versus targeting, obviously, putting the work in to target the proper ideal clients or we call them avatar clients, right, for free or maybe sponsor a $500 lunch. Yeah. That’s incredible. [01:04:13] Pete: And that can be the win-win. It could be buying the lunch. Like you said, you got to determine your win-win in that script but I’m telling you, that script would get you off and rolling to the races. Identify 25, start to call them but make sure your person feels a little bit empowered whoever is calling them. So, they need to have a one pager like here’s the speaking topics, here’s why they’d be a great fit. So, don’t start calling prematurely because I want them to see you as that content provider and that expert, not the person who’s calling from a financial service company or financial advisors company. So, that’s what I would say. [01:04:45] Brad: Okay. So, quick question and then I want to get to you sharing your financial advisor story because I think that’ll be really cool for the listeners. Do you lose any of the positioning power if that’s the actual financial advisor calling? Should that always be kind of a marketing director that’s working more on the positioning or could the actual advisor call if they use a different angle? [01:05:05] Pete: Absolutely. I called. I love when somebody can call on your behalf. I love it but I’m just telling you, I called on my behalf because there’s nobody more passionate about my message than me. Now I have somebody else doing that for me but out of the gates, I was the one to do it. It’s much, it’s definitely more powerful from a positioning standpoint if somebody else is doing it but they have to be passionate about you and your services and really be a believer in you, and if not, the financial advisors can get away with it and can land the stages on their own. They’re not going to lose credibility but that’s once again making sure their positioning elements that we talked about early on are all kind of dialed in. [01:05:46] Brad: Man, I could just see you kind of opened with, “Hey, I was compelled to pick up the phone myself after seeing the event you’re putting on,” and then you’re just like it’s even that much more powerful as long as you kind of opened with the right phrase there. [01:05:57] Pete: Yeah. Absolutely. So, if I were calling like let’s say I was calling the local EO or I was calling the local something, I would say something like this. I would say, “Hey, it’s Pete Vargas.” And there’s another way that you can do this. So, we use a tool called BombBomb. It’s an amazing tool. I love BombBomb.com. [01:08:16] Pete: That’s the script. That’s actually the script that allowed me to win EO Colorado. I’m speaking at EO Colorado and Marc Gutman said it was the only video email that he’s ever received from one of his speakers and he hires six to ten speakers a year. Only video email he’s ever seen. And that was using BombBomb. [01:08:36] Brad: It’s kind of marketing 101 is showing up differently. So, right now it’s funny how nobody knows about BombBomb. You’re actually one of the few people. And so, for those that aren’t familiar, we’ll put a link in the show notes but it’s basically YouTube combined with email makes it super easy to send a personal video to someone. The only other person I can think of that I received a video email from is Jayson Gaignard and he does just an incredible job of making you feel like you’re like the only person on the planet at his events. [01:09:04] Pete: Yeah. So, honestly, if they wanted to get started, BombBomb is easy. You don’t have to pick up the phone. You can see when people open it, when they read it. You can have your link down below to schedule a call. Your call to action can be that. But I send out BombBomb’s like crazy and I have constantly Marc Gutman, JJ Virgin. I mean, there are so many people that have said that was the reason they like the initial point and guess what? I’m going after some big stages. And so that’s why your analytics are right on, Brad. Like it’s easier to win a local stage than it is a national stage. But yet everybody wants to go after all these national stages. The beautiful thing about your community is all of the local stages that exist in their backyard for them to go after. So, I love that, man. I love it and so that’s what I would really encourage them to do. [01:09:51] Brad: Cool. If you can share quickly, it’s always fun when I talk with successful people like yourself, Pete, how you actually found your financial advisor and it kind of all ties together here. So, can you share that story? [01:10:02] Pete: Yeah. So, I’ve had two financial advisors in my life. The first one that I found was when I was a youth pastor and I wasn’t probably her ideal client but I was ready to start investing and I actually heard her speak in my local church, in my local church which is beautiful and I heard her and I’m like, “Oh, I want to have – I need her help.” And I got to believe she got lots of clients in that. Now maybe not all of them were ideal but I do want to sidebar one thing that’s really important. You go speak in front of 50 CEOs or 50 dentists or 50 lawyers or 50 attorneys or 50 business owners. Brad mentioned this earlier. Guess what the next step is? A lot of them are going to want you to come back and speak to their employees or their upper management or their leadership teams. If you are great on stage, the second step of the speaking is now “Cool. I have employees,” like a lot of YPOs, they’ll have 500 employees. They might have you come speak to their upper management team. So, I just want you to know like that could be the next level or you might be able to take that angle out of the gates too. So, I heard her, I hired her. It’s a good experience. I didn’t have a lot of money at the time but she served me and so I heard her speaking. But here’s the cool piece. I’ve now been with my current advisor since 2007 or 2008, maybe 2006. His name is Adam Way. He’s up in Denver and I got the opportunity to, I got introduced to him. I would love to say I got introduced to him from speaking but I wouldn’t be telling the truth. I got introduced to him from a referral. I reached out to people that I trust in my life. I reached out to my pastors, some of my good friends and I said, “I need a financial advisor. I want somebody who you guys trust because if you trust him, I trust him,” and they gave me two or three names and Adam became my financial advisor. And it’s because Adam presented in our one-on-one in a way that none of the others did. He connected with me. Yes, he was dressed up. I’m like, “Dude,” like he was really sharp and fancy and all of that. [01:12:02] Pete: But he presented in a way that was pretty close to the Story Braid framework. Very close to it. But here’s the cool part. I had Adam come into my company, speak to my employees and deliver a talk and as a result, two years later, a year or two years later after I saw that, man, this guy’s the real deal, I had him come speak in my company and, as a result, I believe three, four, maybe five clients he landed on the spot. I think a lot of it was maybe whole life insurance. I don’t remember what it was but he landed three or four clients right there on the spot from speaking to a group of 12 of us. 12 of us. And one of them went on to be an advisor that ended up being a financial advisor working under Adam like two or three years later. So, as he spoke, he landed these clients and that’s – I know that’s a big piece of his business is he actually speaks and when he speaks, he lands clients. So, that’s my experience with not just my first advisor but my current advisor as well. [01:13:01] Brad: Thanks for sharing that. There’s a lot of things advisors can take from that. Number one, the power of speaking from a stage. That was how you connected with your first one. And it’s interesting, nobody’s broken this rule yet. I’m waiting but I’ve asked a lot of really successful people that question and so far, it’s been a referral has been the primary contact with how you connected with your current financial advisors. [01:13:23] Pete: It’s got to be number one. I mean, it’s got to be the number one way for sure. [01:13:26] Brad: As the net worth climbs, it’s less of what I would call these public facing marketing type of initiatives like the guy called in from a radio show or something like that. [01:13:36] Pete: And here’s what I’ll tell you. That’s the beauty like if referral is number one, I’m going to tell you, speaking is a close second because what you can do in 60 minutes is connect in a way that makes them want to have conversation and then trust you. So, that’s what’s beautiful for this like I believe referral is probably the top way especially getting to those people but those people come together and conglomerate together and so why not have your referral start referring you to places that you could speak as well? Because all of your top clients probably go to these types of meetings are part of these types of associations, are part of these types of groups. So, instead of having them maybe refer you one-offs, they might not even – most of them aren’t thinking you as a speaker so why not start getting them to refer you out to some of these stages? Because now when you go to these stages, you got a double whammy like, “Wow. So-and-so brought me in and referred me,” and you get 60 minutes which builds ultimate credibility. Even if you don’t have the referral into the stage, that 60 minutes doesn’t quite offset a referral but it builds trust by being there in front of people. [01:14:38] Brad: All right. I know we’re getting towards the end of our time. One thing if you can just throw this because I kind of left it hanging, you talked about when you booked the stage, you’ve got your three to five-step proprietary process and you said there’s basically now you’re in front of an audience where you don’t know who they are. You didn’t invite them through direct mail so you probably don’t have their names and addresses, phone numbers. What was the nugget, as far as actually throw this out so I now have a lead magnet to connect with them? [01:15:04] Pete: It’s called a contact card. You want to have a contact card. I’ll link one in the show notes or I’ll link one back to you and you’re going to have to shoot me over the things I need to get to you so I can do that. But the contact card on one side has a beautiful graphic or image of the free gift that you gave away during the presentation. Remember, I said give a free gift away during the presentation. And so, that’s the one side. So, now all of a sudden, it’s the give. That’s the give, right? The other side is the ask. It’s their name, it’s their email, it’s their phone number. That’s the critical part, their organization, their title or role, just all of the pertinent information towards the top part of the card. The middle part of the card asks one critical question and your advisors need to decide what that is. If you have a name of your signature process, I wouldn’t say, “Are you interested in our services?” I wouldn’t say that. I would say, “Are you interested in seeing the XYZ signature process implemented in your life?” like in your life or something of that sort. They need to have a critical question that doesn’t come across like completely salesy but it is a little bit salesy and the answer is yes, no or maybe. I’ve done this at YPOs and EOs and they fill out the card, yes, no or maybe. And now the yeses and maybes are obviously a lot of great leads for you to follow up with. And then down below, so their pertinent information towards the top, that critical question in the middle and then down below is the note section for them to add any additional notes which will show you who your hottest leads are because they’re like, “Oh my God, that presentation was amazing. I need to talk with you more,” and then you know those are the people that you need to follow up with. You could a lot of advisors or a lot of people do like a strategy call or a wealth accumulation call or something that actually gives the deliverables. So, maybe in your big bold promise is in this. So, let us find the leads. I know a guy named Derek could help people find like Social Security. [01:16:58] Pete: I don’t know the market well enough so maybe you can make a big bold promise in the strategy call like, “Would you want us to have a certain type of strategy call with you?” I don’t know what you can and can’t do so I don’t want to speak to that but something that you get them to say yes, no or maybe to. That question is the lead into what’s going to begin follow-up process or getting them to be a new client. [01:18:02] Brad: Awesome. Cool. Thanks for sharing that. I want to just kind of tie that all that together. All right. Pete, are you ready for kind of the, we’ll call it the philosophical question section? [01:18:11] Pete: Yeah, man. I love it. [01:18:13] Brad: Cool. Let’s just dig in. When you hear the word successful, who’s the first person you think of and why? [01:18:20] Pete: Tyler Merrick. He’s my best friend. He introduced me to my faith back when I was a young kid. He helped me understand what being an entrepreneur was. An entrepreneur was not just about making money but it was about having freedom. It was about loving your family and it was about making sure that you didn’t compromise the things in your life that matter most which is your family. For me, it’s my family and it’s my faith. And so, Tyler Merrick along with the whole Merrick family. [01:18:45] Pete: His dad and him are very successful entrepreneurs and they just understood the balance of it all. [01:18:50] Brad: Are they down in Texas? [01:18:51] Pete: Yeah. They’re down in Texas. Yep. [01:18:53] Brad: What’s your favorite book that you’ve ever read and how did it impact your life? [01:18:57] Pete: Man, I say this and I said it in all of my podcast but I read the Proverbs every single day. I read the Proverbs every single day. So, a lot of people say the Bible and that’s cool but I say the Proverbs. And here’s the beauty of the Proverbs. There’s 31 of them. And a lot of the months have 31 months and so like I’m rereading the chapter today. I read the 18th chapter today and it’s like it’s my favorite thing to read. It’s so simple. It’s three to four minutes and it’s packed with wisdom. So, I would say the Proverbs. [01:19:25] Brad: Awesome. Is there a book you’ve gifted over the years to people? [01:19:29] Pete: Yeah. Actually, you know what, I guess it’s funny. Our common friend. So, we do a thing and this is not a plug but we do a thing called stage execution workshops and in two days we build out the entire campaign for people so they have a predictable system. You said that like what we’ve talked about today is a predictable system and the free gift that I’m giving you is the predictable system to win stages. And so, the only book that I give out to people is Giftology by John Ruhlin. And here’s why, because one of the big ways that I’ve won stages is by giving gifts to people, not bribing them but by giving them gifts at the time when it makes the most sense. So, like the campaign gives three gifts. It gives the gift after they’ve talked to you on the phone for the first time. It gives a gift if they told you no which is kind of counterintuitive, not this time or not this year or not this month. And then it gives a gift a week after their event because that’s when they’re the most tired. And so, we have three parts of the campaign and it’s all automated. The three parts of the campaign that gives a gift so I give the book Giftology. I want people to be bigger givers in this world and so I love John’s book. [01:20:35] Brad: Yeah. I gifted it to all of my clients and it’s funny how many of them have run with it and we could go off on a tangent here. [01:20:45] Brad: Our industry does gifting so horribly wrong where everything has a logo, everything is attached. It feels like it’s attached to future business promises and everything in Giftology is the exact opposite. [01:21:00] Pete: Yeah. Me too. All of the above for me. [01:21:02] Brad: In fact, I think he pulled us aside and introduced us at mastermind. [01:21:05] Pete: That’s the reason why we’re talking. [01:21:05] Brad: I mean, he’s just that type of guy. All right. Yeah. I want to hear your thoughts on this. What is something, Pete, that you would like to be considered absurd 25 years from now? [01:21:17] Pete: Absurd. Wow. Dude, I’ve never been asked that question. Can I ask you what yours is? [01:21:24] Brad: Dude, you’re flipping the script. [01:21:25] Pete: I’m curious if you’ve thought about that. [01:21:27] Brad: That’s a first. Nobody’s done that. The first thing that comes to mind which by the way I’m not letting you dodge this. We’ll get back to you. [01:21:34] Pete: No, no, no. Yeah, I will. [01:21:37] Brad: Well, it was just last night. My wife Sarah and I – I had Scott Harrison so the CEO and Founder of Charity Water a couple of shows back and speaking of gifts, I like to send gifts to my podcast guests. I mean, this is a huge investment of your time and your time is super valuable and with Scott, I was like, “What do I send?” And then it was just in front of me. I was like his goal is to give everyone on this earth clean water. I was like, well, why wouldn’t I give him that? So, my wife and I made a contribution to his charity and we wanted to include our kids and so we watched the Charity Water videos last night just so they could understand. They’re seven and five. They’re still a little young to kind of figure it all out. And so, I guess if you would say 25 years from now what would I like to be considered absurd, that there are people on this planet, that things that we take for granted like just turning on the faucet, that they’re walking a mile, 2 miles carrying a 40-pound jug full of dirty water for their families so I’d like that to be considered absurd. [01:22:36] Pete: Yeah. That’s amazing. I love what Scott and what they do. I’ve had good friends work for them. I think there are maybe two things that come to mind but the one that’s probably most important to me is I am – I get the opportunity to serve an organization for 13 years that was all about compassion and kindness. Rachel Joy Scott wrote a paper called My Ethics, My Codes of Life and she said, “What if this world was actually really filled with compassion and kindness?” And I kind of working with them for 13 years bought into that concept and I would love to live in a world that’s not full of anger and hate. I would love it to be – I would love the world to be filled with like compassion like Wilberforce did in his days. He restored ethics and compassion in his country and I hope that we can get that back in America. I hope that the way that the negativity exists in our country today 25 years from now would be absurd to think about that compassion isn’t the leading driving factor in our country. And so, it sounds I don’t know how to objectively do that like the water thing is more objective but that’s something that I would – that’s the first thing that comes to mind. My son wants to end homelessness and hunger so I got to buy in with him on that because of him seeing a homeless guy on the church step one day so that would be – I want to help. I’m continually helping Keaton do that on a local level, no pun intended speaking, on a local level but him and I are doing things on a local level and saying, “Bubba, we got to stamp it out locally before we can take it across the world.” So, that’s another one that we actually tactically do things, go feed the homeless, go serve at the shelters and that type of thing in our local community. [01:24:14] Brad: That’s awesome. One of my huge things as a father is just how do you instill that in your kids that just less focus on yourself and more focus on giving to others and it’s sad. I didn’t do the best job when I was younger but the older I get, nothing makes you feel better than doing things that serve others so that’s cool to hear. If only he knew someone that could book stages for him. [01:24:38] Pete: I know. I know. [01:24:39] Brad: [Crosstalk] his message out there. [01:24:41] Pete: I know. Bro, I was reading – and I read something in the Proverbs. There’s no time that you feel better about life and about yourself than whenever you’re serving. Like there’s something that I read last week that’s just like, “Oh my God, that’s so true,” and it was really eye-opening for me. So, yeah, but yeah, we needed to go book him some stages for sure. [01:24:59] Brad: All right. Pete, this has been awesome. So, here’s my last question for you. What is the one piece of advice you can share with the audience that’s led to your success? [01:25:09] Pete: Wow. I think there are a couple of things that have led to my success. I’m going to give one that’s more kind of feel – I’m very passionate about what I do like I am so passionate about what I do and that is a major contributor. That coupled with a little bit of resiliency. I have a lot of friends that say, “You went through a really, really tough life,” and I think that resiliency allows me not to get down on myself as much as maybe other people in my life might get down easily. I get down but I think passion coupled with resiliency has really, really helped me. I also believe belief is a huge thing, huge, huge thing. Not just believing in yourself but believing in other people like the people I tend to attract the most and get closest with in my life are those that believe in me and I believe in them. Like if you just saw the great Roger Federer who just won Wimbledon a couple of days ago, a year ago people were saying, “He’s done. His career is done. He’s losing. He can’t do anything,” and he actually took six months off. And he said in that six months off, they asked him the question as he won Wimbledon a year later nobody – people said he would never win again. He was like kind of where Tiger was. Not personal issues but he was where in his career where Tiger is too that he would never win and Roger Federer said, “I believed in my dreams and other people believed in me.” And so, I think belief is a critical thing to continually believing in those dreams. And so those are three key things for me. It’s passion, resilience and belief. Those are huge parts of my success. [01:26:38] Brad: That’s awesome, Pete. [01:26:40] Brad: Pete, so thankful for you hopping on here and just sharing parts of your story, parts of your framework, how you’ve helped. I think you said your goal is 50,000 stages. [01:26:52] Brad: I mean, you’re crushing it, man. You’re going to get there I feel like any day now with just the passion you bring and the framework that you played out. This was just – I’ve got pages of notes on my side. [01:27:03] Pete: Well, here’s what I would say to all the advisors watching this. Like I didn’t want to use this one because this is not what makes my success but I’ll tell you what’s helped me be more successful since ‘07 is actually somebody putting me on a clear financial plan and I had a couple of advisors speak into my life to say this is the thing you should do, the thing you shouldn’t. And I’m just looking back now 10 years later and I’m looking at the accumulation of wealth and I’m looking at like my whole life insurance policies and how much cash value I have and this is not like a philosophical of what life insurance is right, what life insurance isn’t but I want to tell you what. There are a couple of financial advisors in the last 10 years that kind of set us on the path and now 10 years later, Kim and I have eight real estate or eight rentals where we were trying to pursuit everything that everybody throughout our way like, “Go get oil and go do this and go do that,” and I’m thankful for a couple of financial advisors in my life that helped me get really locked in and laser focused. And now 10 years looking back, this is what we always tell, you always tell your clients like, “Ten years from now you’re going to wish you did this.” I’m glad 10 years ago that I made that investment to a financial advisor and really trusting him so I believe in what every one of you are doing and I want you to reach more people because by changing people’s finances, it can change their life. So, thank you for what you do and I really hope that you will take action on and go and get more stages locally. [01:28:26] Brad: Pete, that’s awesome. Thank you. And our paths will be crossing I’m sure very soon in the future. So, thanks for swinging by and sharing all the knowledge. [01:28:34] Pete: Yeah, man. Thank you. [01:28:40] Brad: Thanks for sticking around to check out our latest show. Here’s this week’s featured review. This one comes to us from J.Rhul who says, “The best leading the best. Not sure how Brad managed to attract heavyweights like Hyatt and Carson so early in his podcasting career but he delivers the goods on each and every podcast. Can’t wait to see what the rest of 2017 holds as I’m a fan.” J.Rhul, thanks for the kind words, my friend. Michael Hyatt, Ron Carson’s episodes were definitely two of my favorite conversations from two guys that I really respect. Not only are they brilliant but they’re just good people overall. And the good news is there’s still a few months left in 2017 so I’m going to do my very best to keep delivering from my side as well. So, that’s it for this week’s show and for those out there who are loving the show and maybe have another financial advisor buddy who could use some great ideas send his or her way, do me and potentially them a favor and email or text them your favorite episode so far and just tell them to give it a listen. I’d really appreciate it. It will help spread the word and spread these ideas from some of our amazing guests and help other financial advisors out there. Thanks for listening to this week’s show and I will catch you next week. Take care. Please keep in mind; “Free” is a prohibited term for many advisers, using “complementary” or “no-obligation” as a replacement for “free” is a best practice. Rule 206(4)-1(a)(1) of the Investment Advisers Act prohibits the use of client “testimonials” in an advisers advertising; seminars and speaking engagements are considered advertising, and the rule may apply to “implied testimonials;” stories about client experiences, shared by the adviser with the audience. Federal law, state law and/or insurance carrier requirements may prohibit or place limitations on marketing activities. All producers and investment advisers should be aware of any gifting limitations imposed by federal regulation, state regulation, insurance carriers, broker-dealers and Registered Investment Advisers, as applicable. Investment advisers are strongly encouraged to obtain pre-approval from the broker-dealer and/or Registered Investment Adviser with which they may be affiliated. Results from the use of these concepts are no guarantee of your future success.